The Player Characters (PCs) are traveling through a fetid, sweltering swamp. Halfway through their adventure the expedition begins to fall sick with fever. At first, just a few torchbearers were sick and then a few porters. Eventually almost the entire adventuring party is sick even a few PCs are ill. The danger made apparent before the expedition. However, they assumed it couldn’t be that bad. After all, they had healing magic at their disposal. Now stranded at the center of a monster-infested morass they are bogged down with a sick and dying expedition. In addition, the longer they stay, the more likely more will fall ill. An invisible tiny enemy has brought them to their knees. Disease has stalled even killed some of the toughest, persistent, and well-provisioned adventurers in history. Strange fevers, boils, sores, pox, food poisoning, parasitic worms, STD’s, and animal born infections have plagued adventurers and military campaigns throughout history. With disease being such an important factor concerning exploration and conquest, a clever Game-Master (GM) would be foolish not to make use of that side of nature. Disease is an underutilized tool in the GM Toolshed and can add to the danger and feeling of a setting. Disease is a world-class force. It can thwart adventurers, jamb the wheels of imperialism, stop the machines of war dead, and even curtail history. However, with all things in the game world, diseases need to be broken down into a few basic ideas. There are three aspects to diseases in respect to roleplaying games that are important. These are Contagion Rate, the Incubation Period, and the Disease Vector(s) through which the sickness perpetuates. The Contagion Rate refers to how contagious the disease is, percentiles can easily represent this. This represents how easily the disease can transfer to an individual. The percentile rate would mean that the exposed character is potentially infected. After this determination, the GM should refer to the game mechanics for what happens next. If the character succumbs to the infection then the symptoms of the disease are often not immediately noticeable. Symptoms and the main effects of the disease will appear after the Incubation Period of the specific disease has passed. Incubation Period refers to how long the disease remains dormant in an infected host; it can still be contagious at this stage. After exposure a character can walk around apparently unaffected for however long the Incubation Period lasts which can ranged anywhere from a few hours to days even years! They can remain infectious during this period as well. Often the more infectious a disease is the shorter the incubation time. A highly infectious disease that has a short incubation time is a plague in the waiting although the quicker the incubation then the quicker the outbreak is likely to burn itself out. Finally, the third idea is the Disease Vector. A vector is the agent that carries the disease to its living host, which can be a living organism or a medium like dust. The infection vectors that can spread a disease are many but the main ones to keep in mind are those that travel through wounds, insect bites, animals (feces & diseased individuals, corpses), and those that are airborne or hide in improperly prepared or stored food. Adventurers need to make sure their food has not spoiled or been contaminated. They should beware of corpses they have not killed themselves. Adventurers also need to care for their wounds even small scratches especially when traversing bodies of water or marsh areas. Of course, they also need to learn how to deal with biting insects especially mosquitoes and flies. Infection can get into open wounds through direct contact with such vectors as dirty clothes, water, mud, and general filth. The improper cleaning of deep wounds is begging for infection. A good example of the result of an infection through wound contamination with serious consequences is gangrene. Gangrene results in fever and possibly the loss of limbs and death not to mention the stench of rotting flesh. Note that gangrene also results from a lack of circulation but the form we are concerned with is the result of bacterial infection. Animal and insect bites are another major vector for diseases. The most obvious one is rabies, if the animal is foaming at the mouth its bite is something to avoid. However, certain animals that are carriers are not so easy to avoid. Vampire bats prey upon sleeping warm-blooded victims. Another infamous example is of the Tsetse fly and its transmission of sleeping sickness not to mention the mosquito born malaria and dengue and yellow fevers. Even such hard to avoid insects such as ticks that can carry lime disease. To finish off the potential vectors of interest to GMs are airborne infections and of course food poisoning. Spoiled food is a major hazard and may transmit mild to severe effects. This usually depends on the type of food, where it came from, and how it was prepared. Also, food contaminated through contact with other vectors such as insects or contaminated water becomes a medium for disease. Another way food can shelter the enemy is by eating infected animals, which may be still within the incubation period. Airborne vectors come about when inhaling germs in miasmatic environs such as gas spewing swamps or burbling cesspits. This includes sharing space with infected individuals with no contact other than breathing the same air. Here, the disease uses the medium of air launched in aerosol form by a cough or sneeze. Good examples of the types of diseases that can spread via these vectors are influenza and the Hanta virus via the dust from rodent droppings. In certain cases, even the wind can become a vector. Another medium that is worth visiting is that of water. Waterborne infections can afflict individuals that drink spoiled or stagnant water. Contaminated water can also infect food that comes into contact with it especially during preparation. Examples of the diseases that travel via water are Dysentery, Typhoid fever, and Guinea Worm. Adventurers should always be suspicious of bodies of water they encounter and not just because of leeches and piranha either. However, in fantasy roleplaying games there are a few mitigating factors even in the more primitive of settings. In RPGs, certain game aspects can mitigate the disease factor. These three disease negating factors are characters that have the ability to heal others aka Healers, potions or elixirs, and magic. Healers are characters that have the ability to heal other characters of both damage and cure diseases or at least ease their symptoms. They can achieve this mystically or with some version of medicine. If disease is a major feature in a setting, these characters become very valuable party members. However, even when Healers are traveling with an expedition that party may want some backup in the form of potions. Potions when consumed heal damage and some can even cure disease. These are usually of a magical nature but sometimes the fantasy separates chemistry, alchemy, and magic into separate areas. This separation does not concern us here, as the mere existence of potions is effective in combating disease. The only factors to consider are availability (who makes them and how long does it take) and cost in both time and money. Meaning the majority of people will not be able to afford these life-saving potions. Alternately, if they can it still might be a rare thing. This is especially true if the disease requires a specific cure or type of potion. As the nature of potions often falls into the realm of magic so magic itself must be taken into consideration. 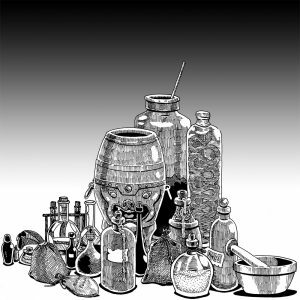 Although healing abilities and potions fall under the purview of magic, they are different strategies due to availability and cost. Unless someone has access to a healer they do not have the luxury of the healer’s abilities and if they cannot find a supply of potions then the same. The same can be said of magic items that may offer protection or even healing abilities to their wielder. These are more accessible to the makers of such items and fall into adventurers’ possession more frequently than others’. Magic items are more accessible than a Healer’s abilities. This is simply because all one has to do is wield the item instead of becoming a healer. They are also more durable than potion bottles thus granting a more portability. Also they are more than likely good for more than a single use. Frankly, the advantage of a disease fighting magical item is so great that it becomes a necessary piece of kit. This is not to diminish a mage or wizard that has disease curing spells but again access is the issue, there must be such a spell-caster present. In a world of limited scientific knowledge and where magic is known to exist how would disease be treated? Just as importantly, how is the welfare of those unfortunate enough to be suffering from infection handled? Historically, disease shaped communities and whole eras of civilization (syphilis, HIV/AIDS, Black Death, leprosy). This includes the formation of colonies and places meant to isolate and imprison diseased individuals. A bustling snake oil industry and quack businesses will spring up. A historical parallel would be the patent medicines of the 18th and 19th centuries. Disease shapes affected communities especially if there is no cure. How society deals with and treats the so affected is important. The example of lepers is especially notorious. Lepers were made to ring bells warning the healthy members of society that they were coming whenever they were traveling in towns and cities if not barred from entry. Lepers were even forced (occasionally voluntarily) into colonies often on small faraway islands or isolated facilities. With laws and forced isolation imposed on victims of disease also comes scapegoating. This being applied to not only the infected but also those that were believed to carry the infection. This includes those accused of deliberately planting the sickness by contaminating water wells or poisoning food by means of witchcraft. These scapegoats may be particular creatures or locations, enemies, social minorities, or newly arrived adventurers or adventurers in general. This also may include a belief that a specific disease is particular to a certain community. The efforts to prevent infection will range from reliance on certain organizations (religious, mages, alchemy, charlatans, etc.) to enforced cleanliness or misguided efforts thereof. Cities and towns could forbid certain types of individuals from entering due to the belief that they are carriers. Disease is a world shaping force that stops invasions dead, halts the movement of goods, money, and troops, altering history. The outbreak of plagues can sweep over the entire planet wiping out whole swaths of civilization leaving an indelible mark on the surviving culture. There are Plagues (an extreme version of a specific disease) that can alter the world as it circulates the globe wiping out towns and cities. International trade can even become a vector such as in the case of the Black Plague and medieval Europe. Small outbreaks can stall wars, halt invasions, wipe out small communities, and kill kings. However, disease, especially plagues, can not only negatively affect the population but also have severe economic repercussions and even present new opportunities. Patent Medicines (real or snake oil) can come about to fill the need effective or not. Quacks may proliferate. The collapse of trade may occur with the isolation of cities or rural areas needed for trade. The reduction of the work force by extreme measure is not only a tragedy but also thereby giving them more power to demand better treatment and pay. In June 1381, 35 years after the Black Death had swept England, the Peasant Rebellion occurred led by Wat Tyler from Kent. The peasant army from Kent and Essex marched on London and captured the Tower of London. One motivating factor of this peasant force was that during the plague they had been granted their freedom and paid to work the estates of the aristocracy. The aristocracy did this in order to keep them from leaving during the labor shortage created by the plague. The peasants were afraid that they would lose these newly won privileges. Plagues damage the laborer population, which leads to a downturn in production of materials and crops for at least a decade and increases the economic and political clout of labor and the lower classes. It actually turns the world upside down. Diseases in RPGs are of value to the GM. Diseases can act as an obstacle to PCs, give certain specialized Healer characters an important role to play, and alter NPCs in dramatic ways. The knowledge of the potential diseases they may face may give the PCs pause and even alter their travel routes. A diseased member of a PC expedition may slow down or stop the group dead especially if more than one of their number is infected. This in and of itself presents its own challenge. That challenge being to find shelter and/or a place to recuperate and recover their bearings. Introducing these illnesses into your world allows the Healer character to do something seemingly small. However, do not be afraid to demonstrate to the other PCs that disease can take quite a toll even if it only is stalling them for a while. Sickness can also alter infected NPCs in a way that can engage players and give the GM more tools to work with. Examples are lepers, sick and dying kids as a source of empathy/sympathy or an adventure hook, dying beggars, the dying and kind old person but for a cure scenario. Making use of diseases can help a GM to enhance their game. They have a tool that can halt armies, delay or kill adventurers, alter the functions of an NPC, and put up a barrier to egress in a remote area. It can add to the flavor of a game as well as engendering some mild danger or at least another sum that the Players will have to calculate. Not to mention the fear factor built up via dialogue delivered by the NPCs to the Players. Microorganisms can stall adventuring parties and armies alike as well as strike down the lowliest peasant as well as the mightiest king. Adding disease to your campaign world can enrich the background as well as alter the roles of NPCs, Healers, and mages. In this same scenario potions and magic items that house healing and disease fighting abilities become more useful and therefore valuable. Certain vectors especially certain insects may become a symbol of terror to PCs who become cognizant of the risk and the need to prepare for an excursion beforehand. Disease as a part of a living campaign world is an invaluable tool for the discerning GM and a valuable source of drama and immersion for Players.